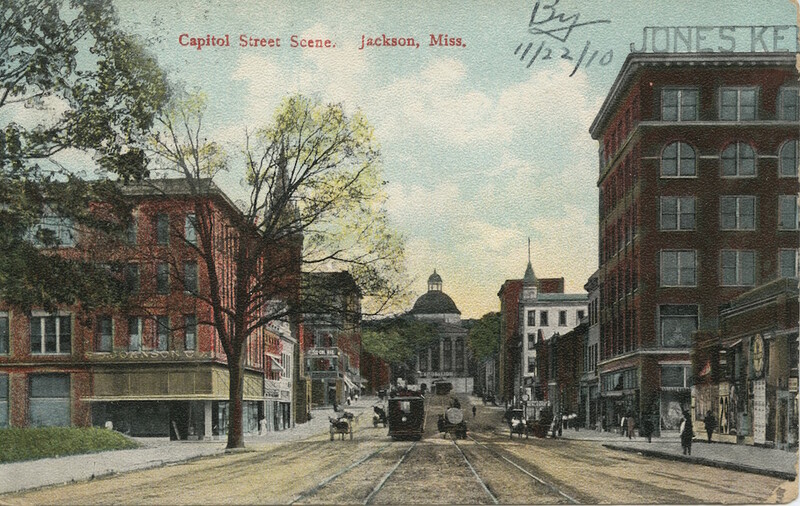 Jackson’s founding was part of an early southern tradition of planned state capitals on the frontier that also included Columbia, South Carolina; Louisville and Milledgeville, Georgia; Raleigh, North Carolina; Cahaba, Alabama; and Tallahassee, Florida. Convenient to the shifting center of population growth, encouraging further development, and exerting new political power over older tidewater or colonial centers, these new capitals reflected planning possibilities before strong central governments disappeared in the face of Jacksonian democracy. In 1821, four years after Mississippi achieved statehood and one year after the Treaty of Doak’s Stand ceded a portion of Choctaw homelands in the center of the state, the Mississippi legislature moved the state capital from the Natchez area to a high bluff overlooking the Pearl River, in the midst of the formerly Choctaw lands. With legislative approval the commissioners of the new city created an enlightened and ambitious city plan with north-south rows of ten square blocks. Along the east margin of this grid were three large public greens, the center one for the future capitol, and the other two for a courthouse and a college. The three greens were positioned on the edge of the bluff, ensuring the prominence of the anticipated public buildings. The greens were connected by a curved street. The streets themselves had an order dictated by their widths. Capitol Green was fronted by State Street and was the terminus for Capitol Street, each of which was one hundred feet wide. College Street and Court Street were also one hundred feet wide but were landscaped boulevard-style and terminated on the east at their respective greens. All other streets were sixty feet wide. Such a clear vision for a seat of government was impressive on the American frontier. However, what really made Jackson’s plan special was the fact that public parks or groves were sprinkled throughout the city in a checkerboard pattern, with alternating squares left open. Public commons for recreation or daytime pastures were not unusual in American cities, but leaving every other square as green space was extraordinary. Pres. Thomas Jefferson had suggested this plan to Gov. William Henry Harrison of Indiana, resulting in a short-lived checkerboard at Jeffersonville in 1802, and to Gov. W. C. C. Claiborne as a healthy extension of New Orleans in 1804. That the checkerboard came with a stamp of approval from Jefferson and the popular Claiborne may have convinced the legislature of the plan’s value. But the idea may have been too ambitious. As funds were needed for constructing state buildings over the next three decades, green squares were platted in lots and sold. Today City Hall and its park and Smith Park are America’s only remnants of Jefferson’s ambitious plan for half-green cities. Four of the original squares were taken in the 1840s for the State Penitentiary and are now a park setting for the New Capitol, built in 1903. Of the three public greens along the bluff, only the Capitol Green survives, with its original Capitol (1839) at the nexus of the major downtown streets. The squares of the original plan remain the city’s only blocks with that shape.